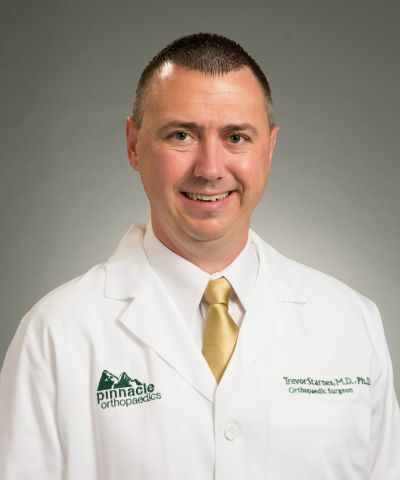 Pinnacle Orthopaedics is excited to announce that Dr. Trevor Starnes is now using a popular carpal tunnel procedure that has had phenomenal satisfaction by patients. The procedure is called Endoscopic Carpal Tunnel Release System (ECTRS). The incision is not in the palm of your hand like traditional carpal tunnel procedures, known as open procedures. A small incision is made at the base of the wrist in non-tensed tissue which allows for easier healing and a smaller scar. Once inside, an endoscope provides a clear view of the underside of the transverse carpal ligament and surrounding anatomy. Thus, giving Dr. Starnes a sufficient view to release pressure on the nerve. Patients are back to work in half the time of traditional procedures. The operating room time has been shortened from 30 minutes to 8 minutes. Studies have shown that there is "faster recovery time, less pain and quicker return to work with this procedure." 20 years of proven safety and reliability through improved technique and product quality. Trevor T. Starnes, MD, PhD sees patients in the Marietta, Canton, East Cobb, and Woodstock locations. Dr. Starnes is an Orthopaedic Surgeon that is fellowship trained in Hand Surgery. He also holds a Doctorate of Philosophy in Biochemistry and Molecular Biology. His specialties include orthopaedic surgery with an emphasis on hand, wrist, elbow and shoulder surgery.